I just got pictures from one of my Christmas orders! 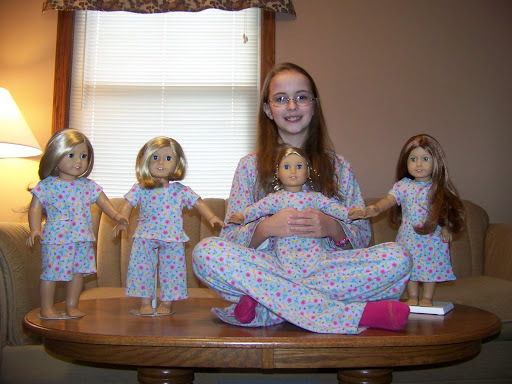 🙂 The order was four doll pajamas and a pair of pajamas for a very special young friend of mine, Anna, and her dolls. 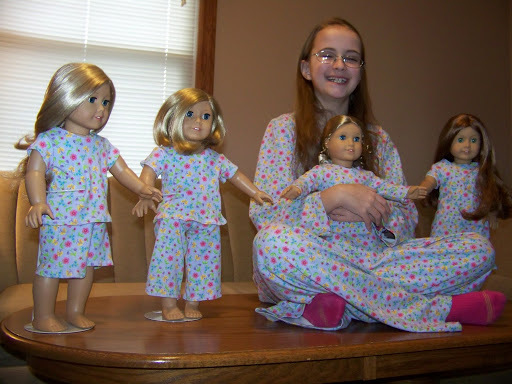 I had a lot of fun with this project, coming up with different styles of pajamas to use with the same fabric. 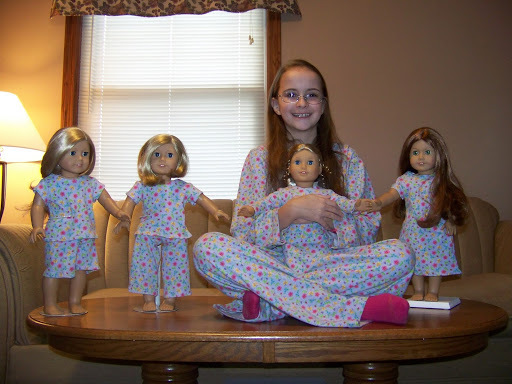 Doesn’t Anna have a lovely little doll family? 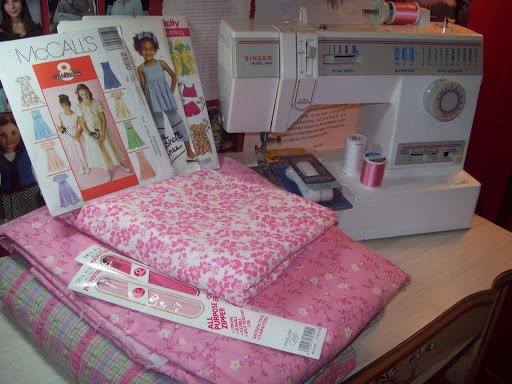 What sewing projects have you been working on lately? 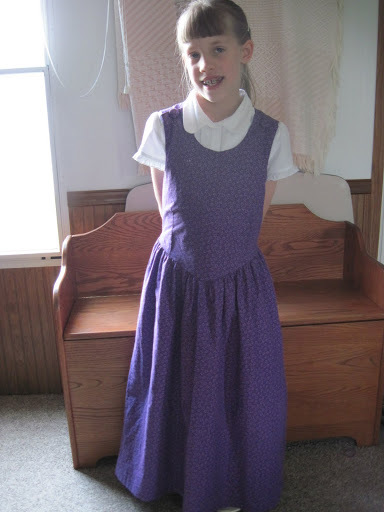 It is based off another dress that the mom of the girl I’m making it for had ordered from an Etsy shop a couple years ago. 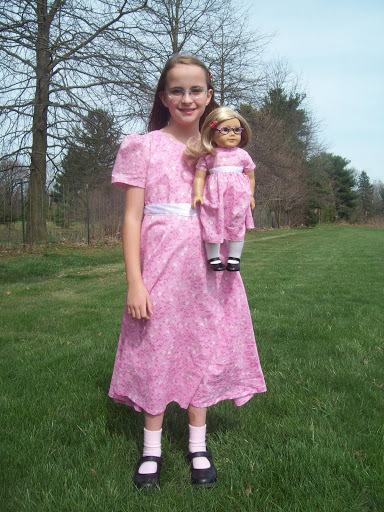 Her little girl has grown out of that dress so she asked me to make one similar to it. The project was fun and easy. Mrs. H bought the T-shirt from the store, then I cut off several inches from the bottom of the shirt, cut out the skirt, and sewed that onto the T-shirt. 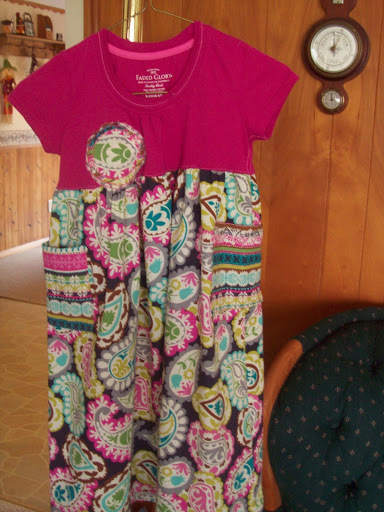 I also added pockets of another fabric and made a fabric “flower” design similar to the one on S’s original dress. Cutting out the circles for the “flower” and positioning them just right was a challenge, but a good one. 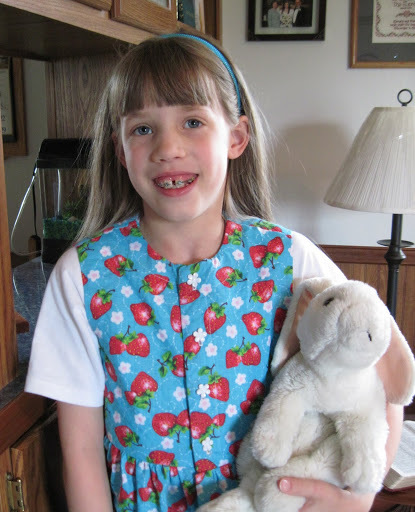 I will be making another one of these for S’s best friend once I get the fabric for it. The doll dresses are also matching (I made the T-shirt piece for the doll dresses from the fabric I cut off from the bottom of the main T). Today I also made the mock-up for my Regency gown for the ball. This is the movie gown I decided to re-make. It is so beautiful! It’s a beautiful day here in my State today; most of the leaves have fallen from the trees, and the sun is casting a silver glow on the edges of the gray clouds interspersed here and there against the sky. God is so good and has been reminding me of His wisdom and care as He orders the events in my life for my good and His glory. It is exciting to see Him at work in so many different ways, from the lives of His people to the intricate details of the leaves changing colors and falling. Everywhere are traces of His presence! Have a wonderful weekend, friends! Keep your eyes on Jesus! Well, you know, Christmas is coming! 🙂 I can’t believe how many sewing projects I have to get done by Christmas!! Oh dear. I’m beginning to feel almost overwhelmed!! But it’s a good overwhelmed. 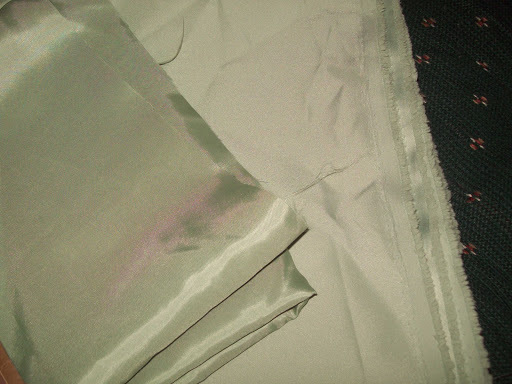 Sewing is, after all, something I love to do. 😉 I just hope I can get everything done in time. Well, I had better get back to work on my project…. 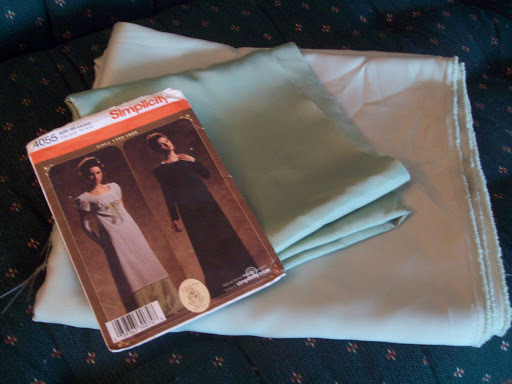 finish the first set of matching dresses and move right away to the bodiced petticoat. Mrs. H had some fabric that had been sitting around the house, waiting to be turned into a dress for Kaylyn. But having three little ones, she doesn’t have much time to sew, so I decided, since I had my dear sewing machine with me 😉 and some patterns, I would make the dress. Were the instructions easy to follow? The directions themselves were, for the most part, easy to understand, but… not entirely. As you will see below. Would you sew it again? Now that I know how to cut everything out and what alterations to make, yes, I think I would sew it again, because I really like how it turned out in the end. 🙂 But while I’m at it, I am going to make my own markings on the pattern pieces. Today I finished a jumper for one of the girls in the family I am staying with this month. Were the instructions easy to follow? Pretty much so; except one portion regarding the placket for the skirt confused me a little bit, and I had to go by what I thought it meant and comparing it with another jumper made from that pattern. What did you particularly like or dislike about the pattern? It’s a cute and pretty easy pattern. I liked it for the most part, except that I prefer a full-bodice lining, and this only had pieces around the neckline and armholes. 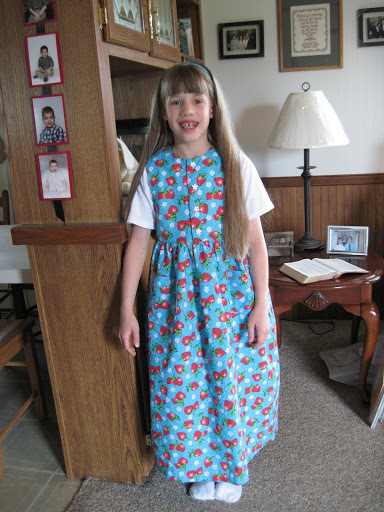 Pattern Alterations or any design changes you made: Instead of doing a contrast fabric trim on the front opening and the hem, I used the same fabric for the front opening and lengthened the skirt piece. I also tacked down the armhole facing and stitched the neckline facing down so it would be easier for Kaylyn to put it on. Would you recommend it to others? I would! I added the ribbon because I thought it just “tied it together” better than leaving it plain. 🙂 It ties in the back and looks so cute! 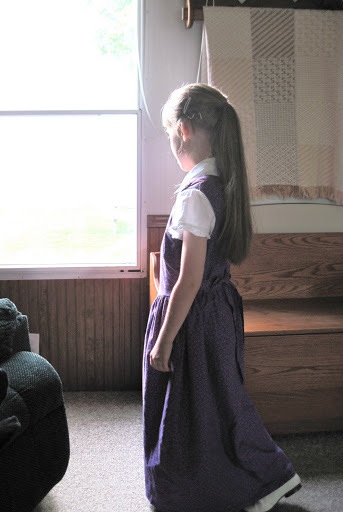 I am making another with the same patterns, but I am going to alter the skirt on Anna’s so that it is gathered like the doll dress. 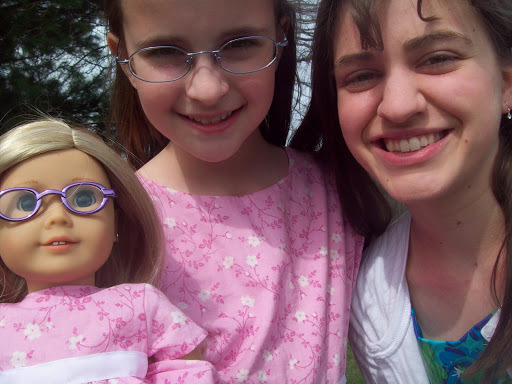 Just for fun, here are Anna and me (and Jessica the doll 😉 ). ….or should I say “sewing projects“?